Adhesive and non-adhesive heathrink tubing and shapes come in an array of shrink ratios, sizes, thicknesses, colours and compounds meeting industrial and military standards and approvals and with operating temperatures ranging from -200˚C to + 260˚C. Designed for insulation, bundling, environmental and mechanical protection, strain relief, identification and colour coding, chemical and abrasion resistance, moisture resistance, encapsulation, and for aesthetic purposes, our heatshrinkable products are a cost-effective, easy to install and versatile solution during manufacture or for repair. Printasleeve stock an extensive range for fast delivery, many of which can be printed (link to printing service) cut and packaged (link to cutting service) to suit customer requirements. 2:1 shrink ratio, thin wall, flexible heatshrink polyolefin tubing with a low shrink temperature. It is a low cost solution ideal available in a full range of colours across the sizes. 3:1 shrink ratio, thin wall heatshrink polyolefin with a low shrink temperature. It is a low cost, fire retardant solution ideal for fitting over irregular or large components. Ultra-thin wall, 2:1 shrink ratio heatshrink polyolefin with a low shrink temperature. It is a low cost solution for space saving and temperature sensitive applications. A flattened continuous 2:1 shrink ratio heatshrink polyolefin with good print performance. It is zero halogen, has a working temperature of 105⁰C and is available in black, white and yellow up to 50.8mm ID as standard. Heatshrinkable sleeve with a textured, non-slip surface ideal for grips and handles. It is flexible, has good abrasion resistance and is available in several colours. A commercial grade, UL approved, fire retardant 2:1 shrink ratio heatshrink polyolefin with a working temperature of 135°C which is readily available in a number of colours. 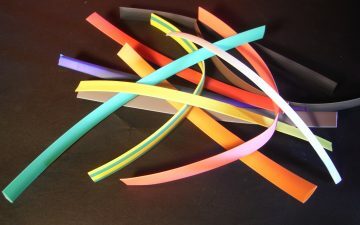 A commercial grade, UL approved, fire retardant 3:1 shrink ratio heatshrink polyolefin with a working temperature of 135°C which is readily available in a number of colours. Flattened, print prepared 3:1 shrink ratio UL approved, fire retardant heatshrink polyolefin supplied on reels with a working temp. of 135°C. Printable labels on ladder-style carriers made of flattened, print prepared 3:1 shrink ratio UL approved, fire retardant heatshrink polyolefin with a working temp. of 135°C. Flattened, print prepared 2:1 shrink ratio UL approved, fire retardant heatshrink polyolefin supplied on reels with a working temp. of 125°C. Printable labels on ladder-style carriers made of flattened, print prepared 2:1 shrink ratio UL approved, fire retardant heatshrink polyolefin with a working temp. of 125°C. A 4:1 shrink ratio heatshrink polyolefin with a working temperature of 135°C. It is a fire retardant sleeve perfect for difficult or irregular shapes. 3:1 shrink ratio, dual wall heatshrink polyolefin with an integral thermoplastic adhesive liner providing encapsulation of inner components, environmental sealing and moisture-resistant insulation. An adhesive lined, dual walled heatshrink polyolefin offering encapsulation in a moisture-resistant, environmentally protective, permanent seal which is available in a range of colours. 4:1 shrink ratio, dual wall heatshrink polyolefin with an integral thermoplastic adhesive liner providing encapsulation of inner components, environmental sealing and moisture-resistant insulation. Medium walled 3:1 shrink ratio heatshrink polyolefin with an integral thermoplastic adhesive liner ideal for insulating and protecting joints and terminations in sizes up to 200mm. Heavy walled 3:1 shrink ratio heatshrink polyolefin with an integral thermoplastic adhesive liner ideal for insulating and protecting joints and terminations in sizes up to 350mm. 6:1 shrink ratio, dual wall heatshrink polyolefin with an integral thermoplastic adhesive liner providing encapsulation of inner components, environmental sealing and moisture-resistant insulation. 2:1 shrink ratio UL approved, fire retardant sleeve meeting MIL-SPEC requirements. Made of heatshrink polyolefin with a working temperature of 135°C, it is perfect for aerospace, military, defence applications. UL approved, fire retardant sleeve meeting MIL-SPEC requirements. It is a 3:1 shrink ratio heatshrink polyolefin with a working temperature of 135°C. perfect for aerospace, military, defence applications. Flattened 3:1 ratio, 135°C MIL-SPEC and UL approved heatshrink polyolefin. It has excellent printability qualities and is ideal for identification in aerospace, military and defence applications. Printable labels on ladder-style carriers made of flattened MIL-SPEC, fire retardant 135°C, UL approved, 3:1 shrink ratio heatshrink polyolefin in a range of colours and sizes up to 50.8mm ID. Printable labels on ladder-style carriers made of low smoke and fume, fire retardant, flattened 2:1 zero halogen heatshrink polyolefin tube ideal for fire safety, marine, mass transit and off-shore applications. 2:1 shrink ratio printable labels on ladder-style carriers made of flattened MIL-SPEC, fire retardant 135°C, UL approved, heatshrink polyolefin in a range of colours and sizes up to 50.8mm ID. 2:1 ratio, flattened 135°C MIL-SPEC and UL approved heatshrink polyolefin with excellent printability qualities. It is ideal for identification in aerospace, military and defence applications. 2:1 shrink ratio zero halogen, flame retardant, low smoke and toxicity heatshrink polyolefin ideal for fire safety applications and often used in marine, mass transit and off-shore applications. Flattened, low smoke and toxicity, fire retardant 2:1 shrink ratio, zero halogen heatshrink. It has excellent printability qualities and is ideal for fire safety, marine, mass transit and off-shore applications. Extremely tough, high temperature, thin wall polyvinylidene fluoride (PVDF) heatshrinkable sleeve with excellent resistance to fuels, solvents and chemicals and temperatures up to 175°C. Heatshrinkable sleeving with exceptional resistance to chemicals, solvents, UV and high temperatures up to 250°C. Naturally non-flammable and non-stick heatshrinkable tubing offering the ultimate resistance to temperature, voltage, chemicals, solvents and UV light with a working temperature of 200°C. Consisting of an outer PTFE layer with an integral FEP inner, this dual wall heat shrink tube is capable of withstanding extremely high temperatures and can encapsulate components in pure fluoroplastic. Easy to apply heatshrinkable tubing offering the same non-stick properties as metal or rubber coverings in standard sizes to fit roller diameters from 16mm to 350mm. Heatshrinkable tubing specially developed to shatterproof UV and white light lamps. It is available in the 3 most common lamp sizes. Ultra-thin wall, low cost heatshrinkable lay-flat PVC offering excellent electrical insulation, an ultra low shrink temperature and resists most chemicals and oils. Flexible, low cost, self-extinguishing heatshrinkable PVC which is 30% stronger than standard heatshrink polyolefin, retains some flexibility after shrinking and resists most chemicals and oils. Diesel-resistant, non-flammable heatshrinkable tube which also offers excellent abrasion resistance. Adhesive tape for use with heatshrink sleeving and mouldings which is often used to seal against moisture or as a means of tamper-proofing. Endcaps, breakout boots and moulded shapes made from heatshrinkable materials and available with or without adhesive lining.